Who else made it to the beach this holiday weekend? I love it when my husband has an extra day off from work and we can get away for a few days. And luckily I’m from the beach so I get to go home, visit with friends and family, and get some sun and sand while at it. Today I want to show you how to achieve the perfect wind blown beach waves for your hair, whether you’re at the beach or not, using the new John Frieda® Beach Blonde™ Collection. There are actually two ways to achieve this look. One is for starting with dry straight hair, and one is for starting with damp natural hair. For both I recommend washing and drying your hair first. 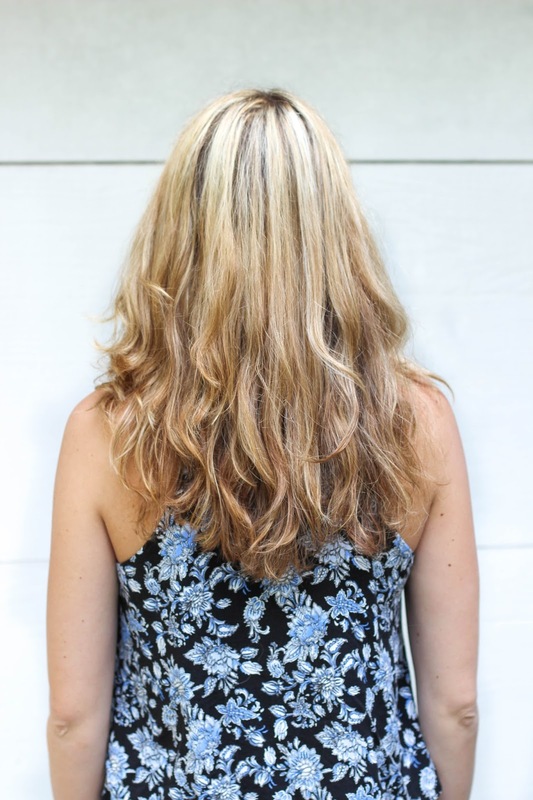 I use John Frieda® Beach Blonde™ Shampoo and Conditioner because it gives my hair some texture and has a great minty fragrance and sensation that feels great after a day in the sun. So first let’s talk about starting with dry straight hair. If this is you you’ll begin by spraying 2-3 squirts of John Frieda® Beach Blonde™ Sea Waves™ Sea Salt Spray around your hair, and brushing it in with a wide-tooth comb. next start twirling your hair tight in about 1 inch sections and spraying each section 2-3 times with John Frieda® Beach Blonde™ Sea Waves™ Sea Salt Spray. Once this is done you should have some light waves and serious volume to your hair. Using a 25 mm curling wand start pulling through random 1 inch sections of your hair, and wrapping it down the wand with the wand pointing down. Hold each piece about 10 seconds then release. The main thing here is not to curl every piece of hair, just a few random chunks. Grab pieces from the bottom, top, back, front, bottom… and don’t do too many. After about 5 minutes of this you should be done and have your beach curls ready to go! I think waves look more beachy and windblown when you start with your hair damp. So if this is you go ahead and spray 7-8 squirts of John Frieda® Beach Blonde™ Sea Waves™ Sea Salt Spray into your hair and brush through to distribute evenly. Using your hands scrunch hair (yes the way you did in middle school) to create some waves. Next dry your hair on medium – low heat while continuing to scrunch, preferably using a diffuser on your dryer. Once hair is dry and slightly wavy go ahead and use the same method from step 2 above! Just pull through some random pieces and curl them using your wand as described above until your hair is just the perfect amount of wavy. 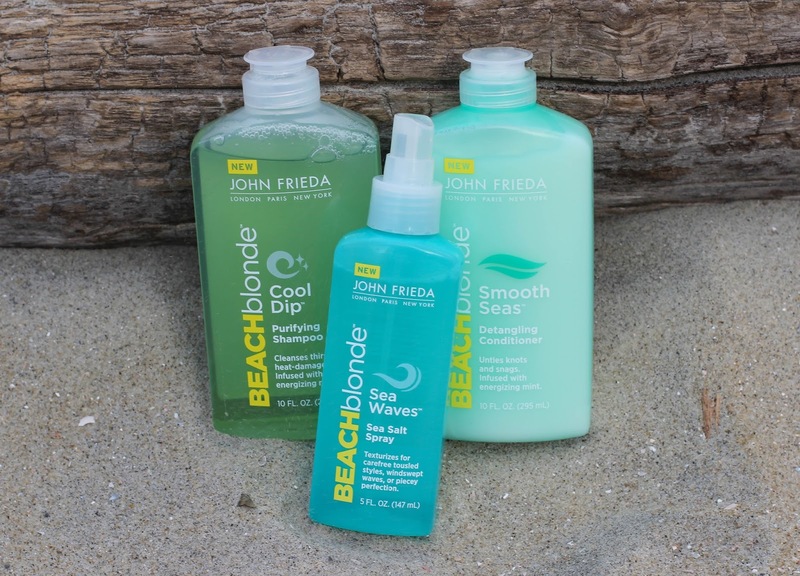 My favorite thing about the John Frieda® Beach Blonde™ Collection is that it’s not just for blondes – any hair color can enjoy these great hair care products! They smell amazing and contain exactly what your hair needs for those sunny Summer days. This collection can be found at Target in the Salon Haircare Aisle. It’s so new that you may have to ask an associate to get it from the back for you! Make sure you check out John Frieda® on Facebook, Instagram, Twitter and Youtube. What’s your favorite Summer hair style? Let me know below! That's usually the case! These are great! 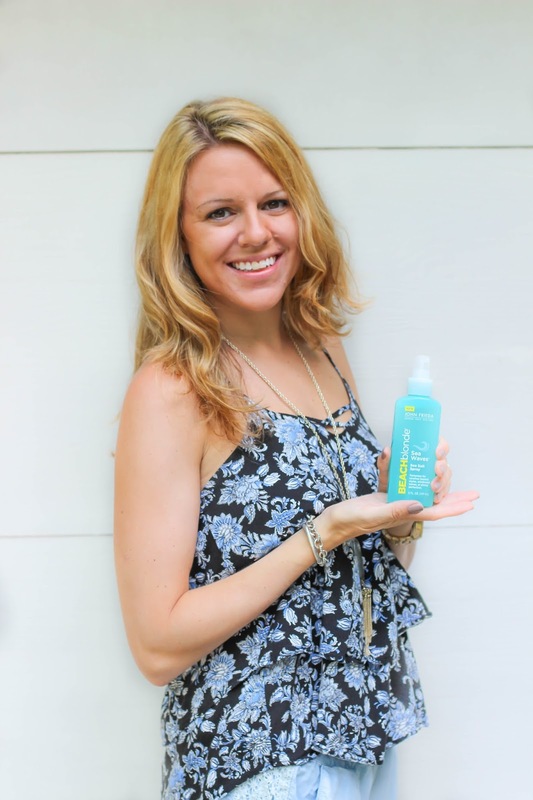 I have been looking for a good (and inexpensive) sea salt spray! 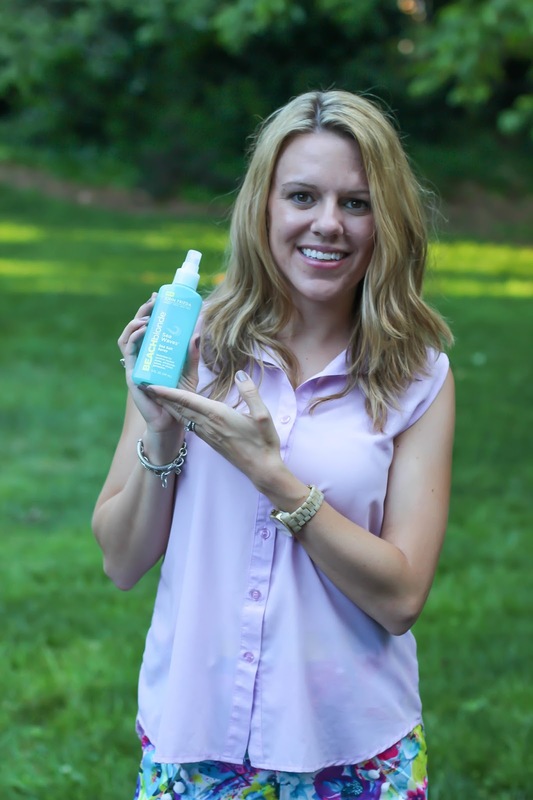 I have naturally wavy hair, but I think the spray would help finish off the look perfectly! Thank you! You should definitely try this one! I'm a big fan! 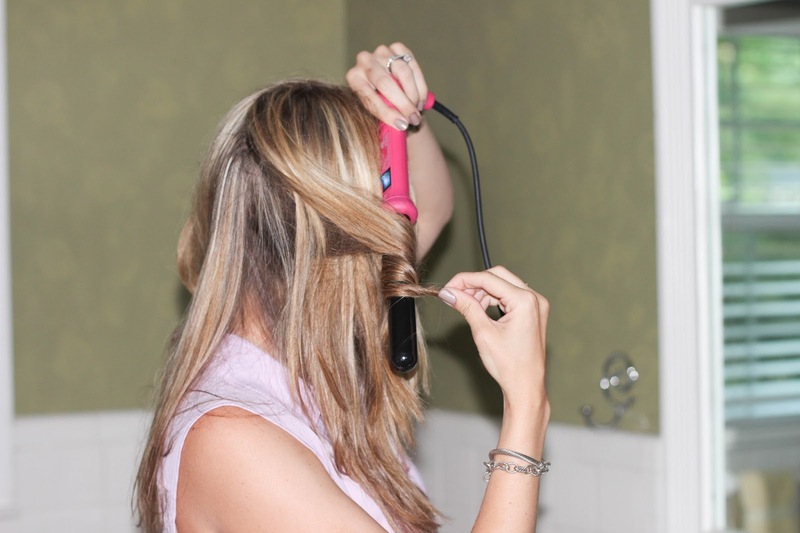 I love beach waves – I use the headband method so I don't have to use any heat on my hair. I have been on the lookout for a spray so I think I'll give this a try based on your recommendation! It's the perfect time of year for some cute beach waves!!!! I think our hair might be a similar type, so it's nice to see that it works on yours! So pretty!! Thanks for sharing what products you used!! Great tips!! I love the beachy waves look, but my pin-straight hair doesn't usually cooperate. I'll have to try out these tricks! I love these products. I am so happy they came back! I remember used Cool Dip shampoo when I was swimming a lot in high school 🙂 Great tutorial!! Two things- my real beachy waves look- not cute at all- as I discovered down in humid Mexico. But I love this tutorial for a regular look here in dry Phoenix! Second- I really want to try that Sea Salt spray as I have a fancy sample of one that is way out of my budget and I love it! Thanks for the review! Ohhh fun! Thanks for the tutorial! I always go air dried and have wanted to try out this beachy hair goodness for a while! I love how your hair looks! Oh I love how it looks. I'm lazy with my beach waves! I spray when my hair is wet. That is probably why it never looks as good as yours does in this post! Always love a good wavy look! Especially when you can't do your hair, you can do a messy/beach waves look. Yours look fantastic! I love love love beach waves! I am a huge fan of air drying so I never have a problem, but I like that this will make them last!